I purposely keep my textile studio low on the technology scale. There isn’t even a phone there (unless I bring it in from the house) and rarely does my laptop make an appearance. Just the wood and canvass, the looms with their whispers and thuds as they work, and one old CD player with a big book of my favorite albums. There’s something about paring things down to the basics–enough warmth, enough light, some Celtic companionship, and my work–that helps the studio be a haven for the making process. 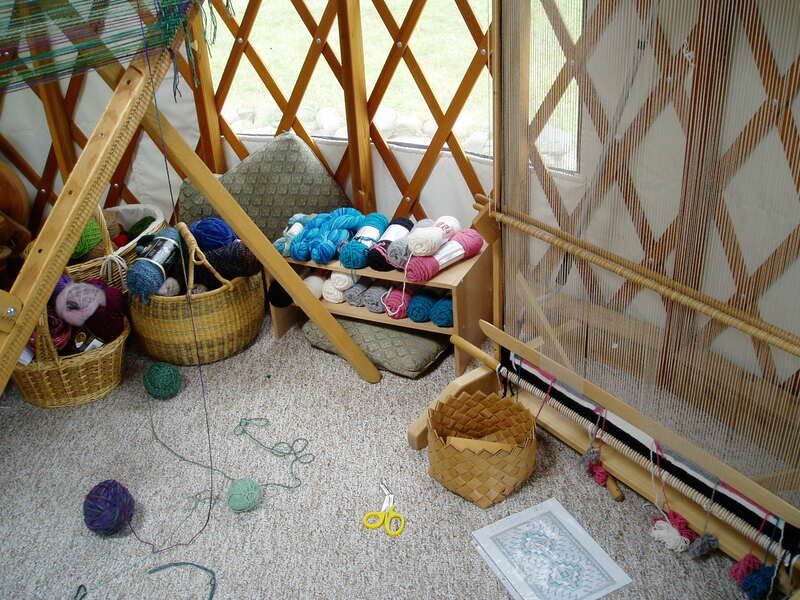 Through the thin walls of my studio yurt, I can hear the songbirds twittering in trees and marshlands, the roosters making their afternoon pronouncements, and a ewe calling for her lamb. It’s a way of connecting back through the layers of textile production and the hands and hearts of ancestors who have carried it forward. Sometimes I count how long I am in the studio by how many albums I play before departing back to farm duties. On a quick day, it’s a one-album stint. On a typical day, it’s a three-album stint. But this day was a five-album marathon! That’s because the finish was so close, so tangible, that stopping was just not an option. I’ll admit, I was working so furiously and the night growing so dark, that I did not have a chance to take pictures in the thick of the event, so I’m borrowing a couple of photographs from when “Nele and the Sea” came off the loom to illustrate this entry. The horn was finished. The lady’s hat was finished. The weaver’s mark was finished (more on what a weaver’s mark is in a later post). And the lady’s shoulder was finished. When I sat down to the loom, only less than a square foot remained of the verdure above the horn. That was all that remained of the pattern (cartoon)! All these years, all these hours, now here was the finish. I wove with a concentration that isn’t always easy to grasp in the studio, checking myself that I wasn’t getting too carried away to lose any depth of detail in the work. Hours later, the paper cartoon ran out of lines for me to follow, and the color work was officially finished. But the weaving wasn’t finished yet–there was still the immensely important salvage to weave to keep the piece from unraveling once tension was released. This is made with cotton cording, matching the warp threads. The very last row or “binding off” includes two lengths of the cording, twisting over each other as you draw them alternately through the warp. 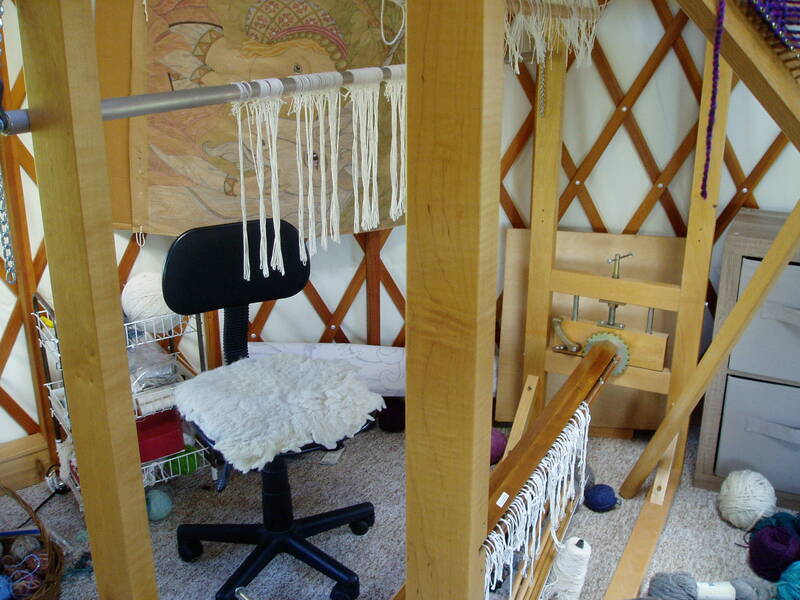 It feels very finalizing, binding off, with the tapestry below and the raw warp above. By this time, my shoulders were completely worn out, and I’d bind off a few inches, then let my arms hang, bind a few more, and repeat. But then comes the real, unavoidable, and almost unthinkable finale to the process–the tapestry comes off the loom. In Navajo textiles, this means slackening the tension, undbinding the tapestry from the heavy dowels that kept it stretched, knotting the corner fringe, and it’s done. Literally done. But in Flemish tapestry, the process is completely different. 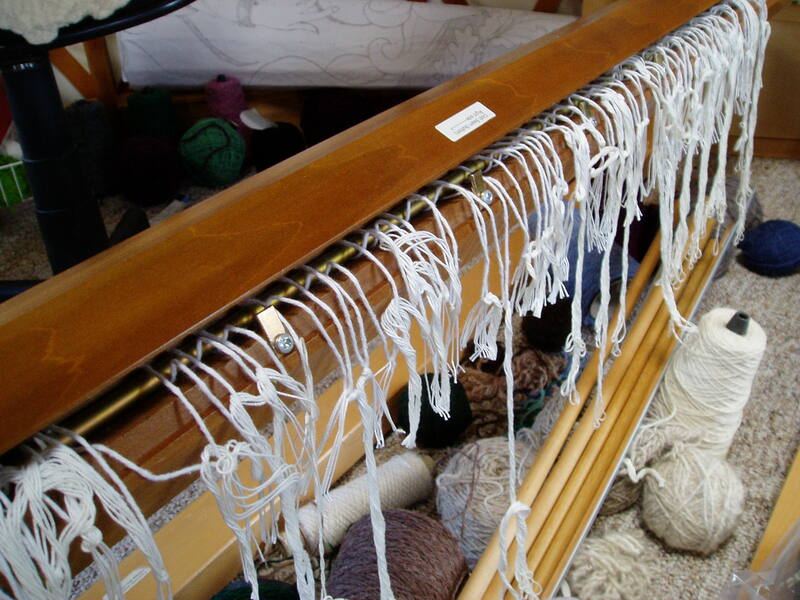 After binding off, the textile is still attached to the rollers, top and bottom. What to do? Cut the warp! I remember my very first tapestry on the Gobelin loom. Months of work, and this moment had come. 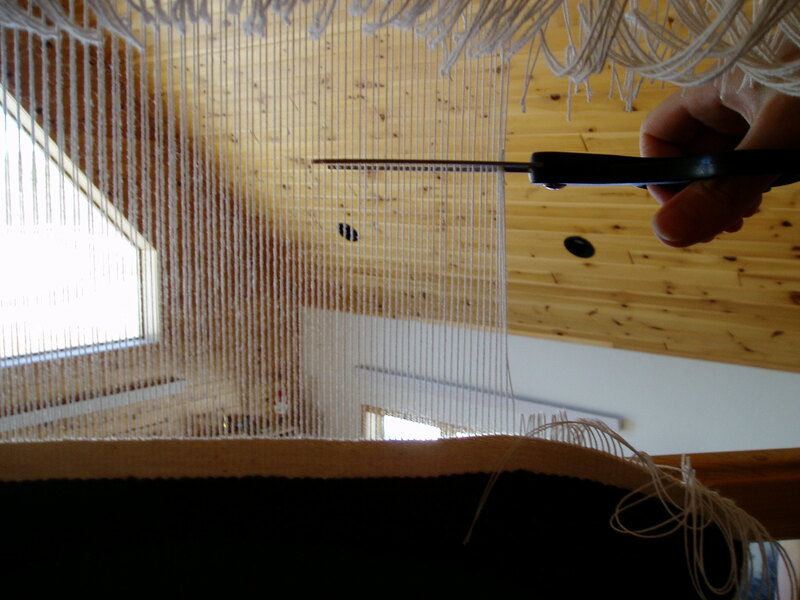 I’d never woven a tapestry without a continuous warp before. What if it all sprung off and unraveled? What if I couldn’t get the ends knotted in time? What if it ended up a messy pile of yarn on my lap? Of course, none of these things happened, but still the thought of taking a scissors to those carefully tensioned warp threads (which have been the weaver’s backbone for the piece since its beginning) is almost terrifying. At this point, there is no going back. No unweaving to fix something. No additions. After the warp is cut, it’s over. I fully expected at this point in the process to be crying. Seven years on this loom–this was a monumental moment. But I wasn’t crying–instead my hands were shaking. I took up that scissors and worked my way across the piece, leaving ample fringe. First the strands went limp, cut-by-cut, then the corner went limp, until at the end, the whole piece fell into my lap as if overcome by exhaustion. It was then time to loosen the bottom “cloth” beam. Part of the tapestry was now rolled onto it, so this would be my first time seeing the work as a whole. As I cut loose the textile from its anchor, I could feel the full weight of it in my arms for the first time. 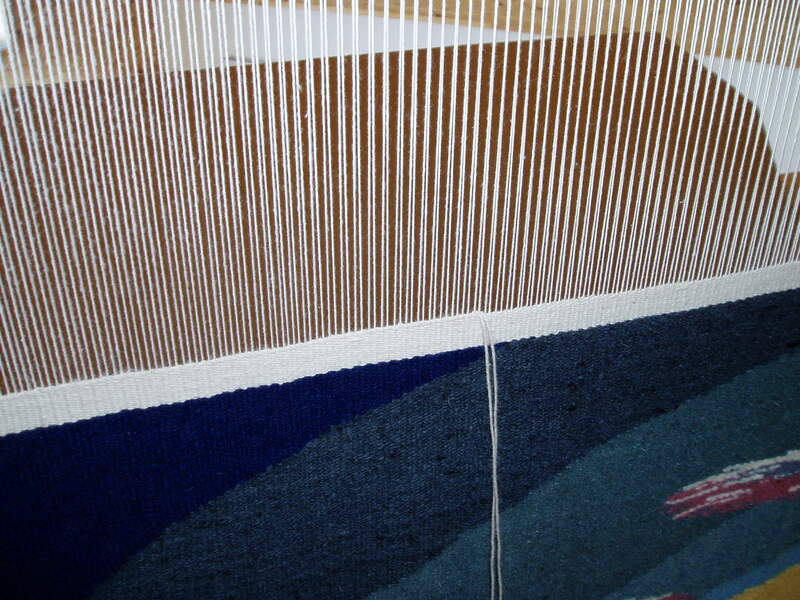 It always surprises me how light tapestry feels, considering how much material is packed into the warp. And as I laid out the piece, horizontal for the first time, my first shock was how small it seemed. Somewhere in this seven-year journey, the piece had become larger-than-life. Now here it was, in its wholeness and actual size. I laughed at myself for a moment, at how I’d thought that somehow seven years of engagement ought to look bigger than this. “It will look bigger on the wall than the floor” I reminded myself. Now it was quite dark and time to roll up the precious treasure and take it inside. After a few days, when venturing back into the studio, something didn’t look right. After seven years, I had grown so accustomed to seeing this tapestry on the loom that coming in to find it empty looked startling, even deserted. Carnage in the studio! The cartoon is still there and the piles of weft yarn. My hand tools still rest where I set them last, as if waiting for the next call to weave. But the dangling, cut warp threads are a testament to the work that once was, for so long, such a dominant part of my textile practice. It really was off the loom, irrevocably. I really had finished weaving a piece imagined during my graduate studies at Goddard. But just as the shock of graduation takes time to sink into the psyche, so too I think will the sock of this piece being complete. Perhaps that will become more real once it’s hanging on the wall–but there’s a lot of stitching between now and then. The tapestry may be woven, but it’s far from ready for the wall. More on that process in the next post.